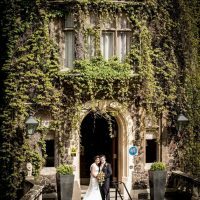 Nestled at the foot of the Malvern Hills in the picturesque spa town of Malvern, the Abbey hotel is the perfect setting for weddings and civil ceremonies. This charming historic building with its Virginia Creeper covered facade, offers stunning views over the Vale of Evesham and its own romantic landscaped gardens. 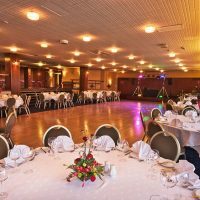 With seven beautifully dressed suites and over 100 individually decorated rooms, this versatile and quaint hotel is a perfect wedding venue for up to 300 guests. The dedicated and professional in-house wedding coordinator can help you create the perfect experience, tailoring your wedding package to suit your taste and budget. For couples who want a stress free and simple approach to planning their special day, the Abbey Hotel offers four customizable set packages. As a special touch, all packages include a complimentary overnight stay for the bride and groom and a complimentary menu tasting for two. Declare your commitments to each other in a choice of seven licensed and beautifully dressed suites. 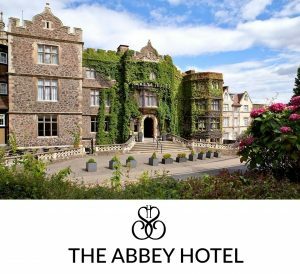 Additionally, couples can enjoy exclusive use of the picturesque Rose gardens when they hire any of the Abbey Hotel Suites. 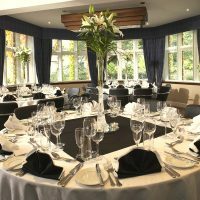 Accommodating up to 70 dining guests or 125 reception guests. The Shaw Suite provides a self-contained setting with its own dance floor and private bar. The feature glass ceiling running the full length of the room can be exposed to suffuse the room in natural light. Alternatively, the full-length blinds can be drawn to enhance your lighting scheme and change the ambiance of the suite. Catering for up to 250 ceremony guests or 300 reception guests. 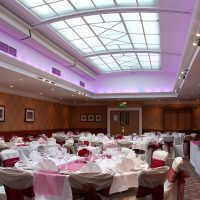 Split over two levels the Elgar Suite is the largest setting and perfect for grand celebrations. Split over two levels the self-contained suite offers a private bar on the upper level and spacious dance floor and stage on the lower level. Couples also benefit from exclusive use of the charming Priory Gardens for photographs and drinks. Ideally suited to smaller intimate gatherings the Worcester, Garden, Malvern, Montgomery and Hereford suites all boast breathtakingly beautiful views of the Malvern Hills or the Vale of Evesham. Tastefully decorated, these harmonious suites are awash with abundant natural light; perfect for beautiful wedding photographs. Following the excitement of the big day couples and guests can unwind in one of 103 beautifully appointed bedrooms. Choose from club, executive, superior or traditional en-suite rooms all of which feature modern touches including free Wi-Fi and luxurious complimentary toiletries. Using locally sourced and seasonal produce, the catering team create a diverse variety of British and Mediterranean dishes. Couples can enjoy delicious buffets or three-course sit down to suit their tastes and requirements.